The ladies are shaking and banging it all the way to the top of the charts! 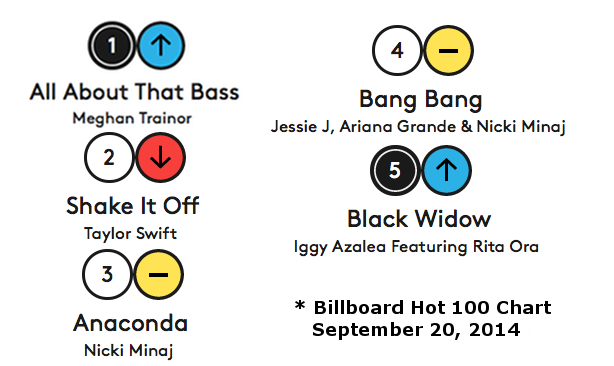 It’s a clean sweep with Meghan Trainor, Taylor Swift, Nicki Minaj, Jessie J, Ariana Grande, Iggy Azalea and Rita Ora holding down the one through five spots on the Billboard Hot 100 this week! This talented group is belting out those wickedly infectious songs that we just can’t get out of our head and this weekend I’m taking their hits to a whole new decibel level! Your speakers are going to say “Thank You” when I drop the needle on custom HK remixes of Anaconda, All About That Bass, Boom Clap, Chandelier, Bang Bang and so much more! So rest, hydrate and repeat in preparation for this weekend, when I’ll be tearing the roof off!